a commodious new Brick Building, on a piece of Ground in Bunhill-Fields, leased of the City for 61 Years, at the Rate of 20l. per Annum Ground Rent. The Charge of the Building was defrayed by Subscription. It was opened 1724, and last Year had 110 old Men and Women, and 53 Boys and Girls, chiefly employed in picking of Ockam, knitting, and spinning. THE Government of it is in the Hands of two Church-Wardens, four Overseers of the Poor, twelve Trustees; and these Gentlemen have appointed a Master and Mistress to live in the House, and take Care for managing the Stock of Provisions and Materials laid in for Feeding and Employing the Poor in the most frugal Manner, according to the following Rules. Rules and Orders to be Observed by the Master and Mistress of this House. I. THAT the Master keep a just Account of all Provisions received into the House, and what is each Day expended, and how many Persons are provided for. II. THAT he keep an Account of all Work received, what is delivered to each Person each Day, and what received back, in Order to know their Earnings, and to give an Account to the Trustees for the Time being, or to whom they shall appoint to inspect the Accounts, that they may know the Disbursements of the House, and also the Earnings. III. THAT the Master and Mistress take Care that the Poor be kept to Work, from Lady-Day to Michaelmas, from 6 in the Morning to 7 in the Evening; and from Michaelmas to Lady-Day, from 7 to 5; and that they rife by 5, and go to Bed by 9, the Summer half Year, and the Winder half Year by 6 and go to Bed by 8. IV. THAT they take Care the Provisions be cleanly and well done, and that all Persons have their Allowance at these Hours, viz.— Breakfast at 9, and half an Hour's Time to eat the same; Dinner at 1, and an Hour's Time allowed them; their Supper in the Summer half Year at 7, and in the Winter at 6; and the Persons that have not done their Day's Work by Supper, that they work after, to finish the same. VI. THAT the Mistress take Care of the Washing, and keeping clean of the Boys and Girls, and that their Heads be comb'd every Day; and that she teach them, or cause them to be taught to read: And that every Child have an Hour's time allowed them to be instructed to read, and also cause them to learn to spin, or knit, or do some other Business, to keep them from Idleness. V. THAT the Master see all the Men and Boys Candles out each Night, and the Mistress the same by the Women and Girls. VII. THAT if any poor Persons refuse to work, being able, or mis-behave themselves, by fighting, or making a Disturbance, that he or she be kept at half Allowance, or upon Bread and Water; and, at the Expiration of two or three Days, that he or she be complain'd of to some Magistrate, in order to be sent to the House of Correction. VIII. THAT neither the Master nor Mistress buy, sell, or suffer any distilled Liquors to come into the House; nor any of the Poor to smoak Tobacco in their Lodgings, or the Work-House: And when any of them are sick or lame, that the Master and Mistress give Notice to the present Officer, that they may have Care taken of them. IX. THAT on Wednesdays and Fridays after Breakfast, the Master cause the proper Psalms for the Day, a Chapter in the Old and New Testament, the Litany, with other Prayers for the Day, to be read: And that every Sunday at 9 in the Forenoon, the same be read; and such as are able to go to Church, or other other Place of Worship, that they go, so they return in Time: And in Case any of them go to any House, or are found loitering their Time away in the Fields, or begging, that the Officer have the Offender sent to Bridewell. X. THAT the Master and Mistress be under all such Restrictions as shall be thought necessary to be made by the Trustees, or the major Part of them for the Time being, relating to the Poor and Work-House. And the Master and Mistress be subject, if required by the said Officers, or the major Part of them, to make an Affidavit before a Justice of the Peace, that there hath been no Waste or Embezzlement made by them, nor by any other Person or Persons, with their Knowledge or Consent, of any of the Stores or Provisions committed to their Charge: And in Case the Matter or Mistress shall not be thought capable of the Trust, that then it shall be in the Power of the said Officers and Trustees, or the major Part of them, upon Notice given to each Officer and Trustee to meet at a Time appointed, signifying to each Person the Occasion of Meeting, to remove the said Master and Mistress, either by giving a Month's Warning to go out, or otherwise to discharge them immediately, and give them a Month's Salary. St Luke's workhouse site, 1746. St Luke's constitution meant that St Luke's largely fell outside the jurisdiction of the 1834 Poor Law Amendment Act and it continued to manage its own poor relief. In 1868, the recently formed Metropolitan Asylums Board set up six new Sick Asylum Districts for the purposes of providing hospital care for the poor on separate sites from workhouses. One of the new Districts, named Finsbury, comprised the Holborn Union together the parishes of St James & St John, Clerkenwell and St Luke's. However, the large new hospital required by the new scheme was felt to be too expensive and, instead, the Finsbury Sick Asylum District was reconstituted as an enlarged Holborn Union. There are eight wards, and the cubic space provided for each bed is 750 ft, in accordance with the requirements of the Poor-law Board. Messrs. Crabb & Vaughan undertook the work for £10,089. The construction of the drains will involve an outlay of £1,200; but all things considered, the total cost of the work will not exceed £12,000. Mr. H. Saxon Snell is the architect. It is stated almost as a merit that in the building the beds are ranged opposite to one another along the internal walls in each ward, leaving a central gangway between; that the windows are in the external walls at either end, and the current of air between them is, therefore, down the central gangway; any down-draught from the glass being harmless. As it is stated that another block of such buildings is to be erected, we think it desirable to say that this arrangement, by which the air supplied to the patients is made to pass over other beds from end to end, is, to our minds, exceedingly objectionable, and should not be repeated. The cost of the buildings, including architect's ission and other contingencies, is put at £27 per bed. The layout of the workhouse in the early 1870s is shown on the large-scale map below which dates from around 1873. St Luke's parish Vestry Hall lay at the south of the site which contained a meeting room for the parish's Board of Guardians. Receiving wards for new admissions stood at its west. Along the west of the site were male and female imbecile wards, a nursery and female infirm wards. A dining-hall and chapel were located at the centre of the site and along the east were female wards, casual wards and workshops. The map shows relatively little male acodation — this is probably explained by the fact that at this period, able-bodied males would have been sent to the Poplar workhouse. St Luke's 1871 ward block from the south-west, 2001. In a further redevelopment in 1877-9, infirm wards and administrative offices were erected along Shepherdess Walk at the east of the site which continued to be known as St Luke's workhouse. St Luke's new infirm wards and offices form the east, 1879. INFIRM WARDS AND ADMINISTRATIVE OFFICES OF ST. LUKE'S WORKHOUSE. This range of buildings, fronting Shepherdess-walk, City-road, is erected from the designs of Mr. H. Saxon Snell, architect, and forms a portion of the reconstruction of St. Luke's workhouse. The central block contains the entrances to the building, and the receiving wards and master's offices and residence, also the lying-in wards, and dormitories for those able-bodied paupers who assist in the general work of the establishment. The wings on either side are for the acodation of the male and female infirm paupers of the union. Generally, the plan of the building is similar to the model infirm wards erected some ten years since at St. Marylebone Workhouse from the designs of the same architect, but upon a much more extensive scale. It has become almost a universal rule in the planning of any description of wards used for the reception of the sick, that the beds should be ranged opposite to one another, and down each side of the exterior walls of the apartments, and that between the beds there should be opposite windows. But it will be seen that one disadvantage of this plan is, that the bed being next an outside wall, the patient occupies the coldest position in the room. This objection can best be appreciated by those who have experienced the increased warmth and comfort of a house standing between two others, as compared with the corner house of a row. It is, nevertheless, counterbalanced by the fact that ventilation by opposite windows between the beds has been found the most perfect that can be obtained, and so far the plan must continue to be adopted in all buildings where other circumstances do not suggest an alteration. This principle of ventilation by opposite windows, however, only holds good where the cubic space allotted to each patient is so large as to admit of the beds being placed far enough apart to insure the inmate freedom from the effect of the draught passing between the windows when open, or the downward current of cold air proceeding from the glass when the external atmosphere is colder than that of the room, and the windows are shut. This point appears to have been overlooked; and large public buildings have been erected where the beds are not only so close to the windows that the patient must suffer to a greater or less degree from the effects of through and down draughts; but in some cases the beds are necessarily placed directly under the windows, and this, together with the proximity of the bed to an outside wall, can hardly fail to have an injurious effect on the inmates of the wards so built. 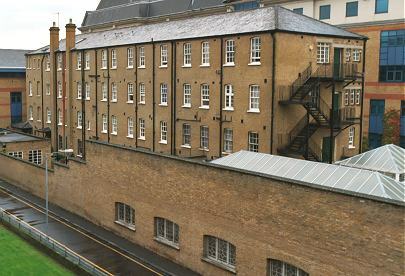 In order to avoid this evil, Mr. Snell considers that the beds of all such wards should be placed at a distance of not less than 6 ft. apart, and when the space allotted to each inmate will not admit of this distance, then some other plan should be adopted, as in the new buildings at St. Marylebone and St. Luke's Workhouses, where the beds are ranged opposite to one another along the internal walls and partitions in each ward, leaving a central gangway between. The windows are in the external walls at either end. The internal walls next the heads of the end row of beds are hollow, and contain large air-flues which permit the introduction of warm air under, and an exit for foul air over, each bed. The St. Luke's Workhouse buildings consist of four stories of wards, and, in addition, store and day rooms in the basement. The wards generally are 80 ft. long, 40 ft. wide, and 13 ft. high, with four bay windows, each 16 ft. long, and 6 ft. wide, and this allows 800 cubic feet of air space to each inmate. Touching the heating and ventilation of the wards, the skirting at the back of the beds' forms a box 9 in. square, with a perforated zinc front, and running through this box are hot-water pipes. At the ends of these channels in the front and back walls are large openings, through which the external fresh air is admitted, and, passing over the hot-water pipes, it is warmed and rises upwards, and is emitted through the perforated front of the skirting boxes into the wards immediately under the beds. The foul air is carried off through wide channels in the ceilings, which unicate with large flues running up the side walls, and terminating just above the level of the eaves of the roof. The upper wards, occupied by the bedridden, are somewhat differently constructed from those of the lower wards, inasmuch as the ceilings follow the line of the sloping sides of the roof, which is supported at intervals by semi-elliptic cast-iron ribs. The escape of foul air in these upper wards is provided for by a channel in the apex of the ceiling, running the whole length of the room, with zinc shafts at intervals open to the air. The wards at the southern end of the buildings were differently planned, in order that bay windows might be placed in the end walls, and so that they would have a more cheerful outlook on to the City-road than was possible in the case of the other wards. Moreover, these wards are occupied by the more convalescent patients, and therefore ventilation by the windows can be effected when the inmates are not lying in bed. The gas-burners of the wards are contrived to serve the purposes of ventilation by being placed under inverted enamelled iron basins, from the tops of which are pipes unicating with horizontal wrought-iron tubes running the whole length of the ceilings and into the upright shafts of the side walls. These tubes, it is understood, not only carry off the products of combustion, but they largely contribute to changing the air of the rooms. In addition to the hot-water pipes, there are in each ward two open fire-stoves, that tend to give a cheerful aspect to the rooms in cold weather. These stoves are placed against the outer walls, and have openings underneath for the supply, from the outside, of fresh air, which, on entrance, strikes against the heated cast-iron hearth-plate and fire-brick sides, and is thus passed into the room in a warm state. ; The nurses' rooms, situated between the wards, are entered off the staircases on the various floors ; they are for the acodation of the paid nurses only, the pauper assistant nurses being housed at another part of the building, especially set apart for this class of inmates. Adjoining the nurses' rooms are large well-lighted closets for the storage of clean linen. The central portion of each wing contains the staircase, nurses' rooms, lift, bath-room, water-closets, and lavatories. The staircases are lighted from the roof, and on each landing there are entrances to the cages of the hydraulic lifts, 8 ft. long and 4 ft. wide, used for raising the bedridden to the top floor, and for the conveyance of coals and meals to the various wards. The baths, scullery-sinks, and water-closets, are next the outside wall, and their contents are discharged directly into two large cast-iron pipes that run down the exterior face of the building, after the manner of ordinary rainwater pipes, and thence into the road sewer. The joints of these soil-pipes are made air-tight, and the upper portions above the level of the highest set of closets are turned into flues in the wall, having outlets at the level of the ordinary chimneys. The level of the ground-floor is 5 ft. above the pavement outside, and underneath is a well-lighted dry basement, used as store, work, and day rooms. On this floor is a corridor of unication, 12 ft. wide, connecting all parts of the building, and also the washhouse and kitchen, both new erections, situated on the same level, but outside the main building. This subway is one of the most useful features of the building, for by it the whole of the meals, coals, &c., are brought in trucks to the foot of the lifts, up which they are raised, then wheeled to the different wards, and when empty returned in the same manner. The building has been erected in three different sections, and the builders were respectively Messrs. Crabb & Vaughan, Messrs. Wall Bros., and Mr. John High. The heating and sanitary works, and the lifts were executed by Messrs. Turner & Co., Messrs. Potter. & Sons, and Messrs. May Bros. ; the gas pipes and fittings by Messrs. Abercrombie & Sons and Messrs. Jeal Bros. The whole of the block of buildings, acodating 930 inmates, besides the administrative offices, work-room, &c., cost 36,0001., or less than 381. per bed, and this amount includes all stoves, fixtures, engineering, and sanitary works, and architect's ission. The compact arrangement of the wards is shown on the architect's plan below (click on the image for an enlarged version). The hospital later became the Holborn and Finsbury Institution. It was taken over by the London County Council in 1930 for the care of the chronic sick. In 1936, it was renamed St Matthew's Hospital. In October of the following year it became a 627-bed general hospital for the sick, with its association with poor-law patients then ending. On 8th October, 1940, the old south ward block suffered a direct hit from a high explosive bomb, killing many patients and some members of staff. In 1948, the hospital joined the new National Health Service as one of the Central Group of Hospitals of the North East Metropolitan Regional Hospital Board. In February 1952, visitors from the King Edward's Hospital Fund for London described Saint Matthew's as "a dump for the chronic sick, the buildings being no less antiquated than those of Saint Leonard's or Bethnal Green, patients still being acodated in great 40-bedded wards". From 1948 to 1954, great efforts were made to improve conditions at the hospital, but in 1960 it was reported that the progress had not been maintained. Saint Matthew's was by then a 320-bed hospital for the care of geriatric and chronic sick patients. The south west block was still standing empty and the war damage only partially repaired. The hospital finally closed in 1986. 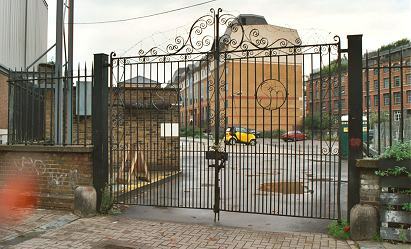 In 2001, the southern entrance to the site on City Road still had gates bearing the initials "SM" — St Matthews. St Matthew's site entrance from the south, 2001. The main surviving workhouse building is the northern part of the 1871 ward block which has now been converted to flats. London Metropolitan Archives, 40 Northampton Road, London EC1R OHB. Holdings include: Workhouse admissions and discharges (1743-69); Guardians' minute books (1836-1930); Admissions and discharges (1860-1931). The Builder (18th March, 1871; 11th January, 1879).